I saw an interesting question this week about auditing vMotion events and the number of times a VM has migrated to a particular ESX(i) host for license compliance. You can view this information using the Task/Events in your vCenter Server but you can also extract out the various types of events using the EventManager in the vSphere API. You will be able to go as far back in time as your vCenter Server's database retention policy allows you to. We will be searching for the VmMigratedEvent Event which will include variety of information including the source and destination host for the VM. The destination host will only be populated upon a successful vMotion. 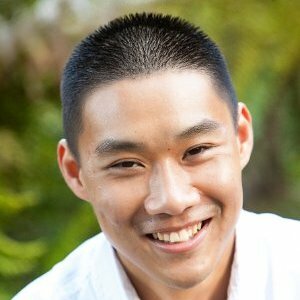 Of course I had to write a script to help automate this, so here is a vSphere SDK for Perl script called getNumberOfvMotions.pl that accepts the name of an existing VM and will return the number of vMotions that has been performed on the VM as well as the list of destination hosts and the number of times it has migrated to those hosts. You will need a system that has the vCLI installed or you can you use vMA. Note: If you want to look at past vMotion for a VM that no longer exists, this is still possible, but you will need to parse the "message" within the Event as you can no longer look up that VM object in vCenter. You can easily modify the script to audit all VM's in your environment or just use a simple "for" loop to go through a set of VM's you are interested in, but I will leave that as an exercise for you. This week I helped to answer a few questions about creating your own ESXi 5 bootable ISO along with automatically using a static IP Address when the custom ISO first boots up. Although all this information is available via the vSphere documentation, it may not always be easy to put all the pieces together and thought I share the steps for others to also benefit. You will need access to a UNIX/Linux system and a copy of the base ESXi 5 ISO image. In this example I will be using VMware vMA and VMware-VMvisor-Installer-5.0.0.update01-623860.x86_64.iso and walk you through two different configurations. We will also be referencing the vSphere documentation Create an Installer ISO Image with a Custom Installation or Upgrade Script and Kernel Boot Options. In this configuration, we will create a custom ESXi ISO that will boot with a static IP Address and use a remote ks.cfg (kickstart) configuration file. Step 4 - Edit the boot.cfg and specifically the "kernelopt" line to not use the weasel installer but kickstart and also specifying the remote location of your ks.cfg. To get more details on the various kernel boot options, please take a look at the vSphere Boot Options documentation above. You will also need to specify the static IP Address you wish to have the host automatically use when the ISO first boots up on the same line. You now have a new bootable ESXi 5 ISO called "custom_esxi.iso" which will now automatically boot up with the specified static IP Address and install based on the ks.cfg that was specified. Similar to the above configuration, we will create a custom ESXi ISO that will boot with a static IP Address but use a local ks.cfg (kickstart) configuration file that will be included within the custom ISO. Step 8 - Change into the "esxi_cdrom" directory and edit the boot.cfg just like the above, but we will be using the "file://" stanza to specify the path to our ks.cfg, static IP Address as well as adding our customks.tgz to the module list to ensure that it loads up which contains the actual ks.cfg file that is called in the boot.cfg. Step 9 - Same as Step 5 above, you now just need to run the "mkisofs" utility to create your bootable ISO. You now have a new bootable ESXi 5 ISO called "custom_esxi.iso" which will now automatically boot up with the specified static IP Address and install based on the ks.cfg that is included within the ISO. Last year I wrote an article called Automating Storage DRS & Datastore Cluster Management in vSphere 5 and I provided a pretty comprehensive vSphere SDK for Perl script to help administrators automate Storage DRS configurations. These past few months I have noticed an increase in interest on the VMTN developer forums relating to Storage DRS. 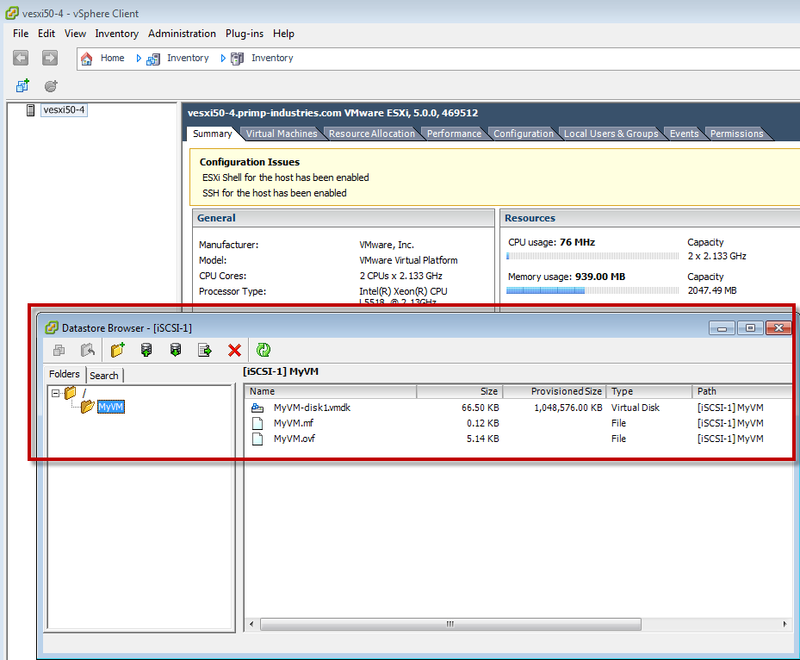 Majority of the questions has been related to which vSphere API methods to use and how to use these methods for cloning VMs to datastore clusters. If you have cloned a VM before, the underlying vSphere API method being used is the CloneVM_Task(), but when cloning a VM to a datastore cluster, a different API must be used. Call RecommendDatastores() which accepts very similar input as the CloneVM_Task(). In addition, you need to specify the datastore cluster also known as a Storage Pod in the vSphere API as well as the "type" (create, clone, relocate, reconfigure), in this example we will be performing a clone operation. This method will then generate a recommendation on where to place the VM which is based on the SDRS placement engine. No provisioning will occur at this point, just a placement recommendation. To perform the actual provision of the VM, you will need to call ApplyStorageDrsRecommendation_Task() which accepts a recommendation ID that was generated from the first step. Once the recommendation is applied, the provisioning of the VM will start just like it did when you called the CloneVM_Task(). Note: The RecommendDatastores() will return multiple recommendations, the best one will be first entry in the array. This is the same algorithm used when performing this same operation in the vSphere Client, it also selects the first recommendation. Now that we understand how the APIs work, let's take a look at how we can leverage this in a script for some automation! Here is a simple vSphere SDK for Perl script called datastoreClusterVMProvisioning.pl which allows you to clone an existing VM onto a datastore cluster. 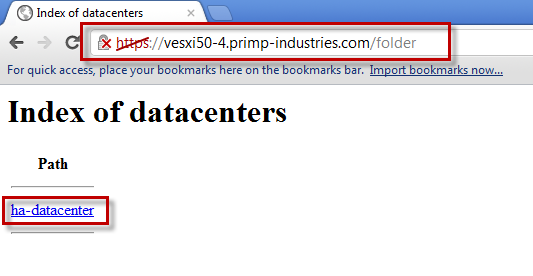 You will need a system that has vCLI 5.0 installed or you can use VMware vMA 5 to run the script. 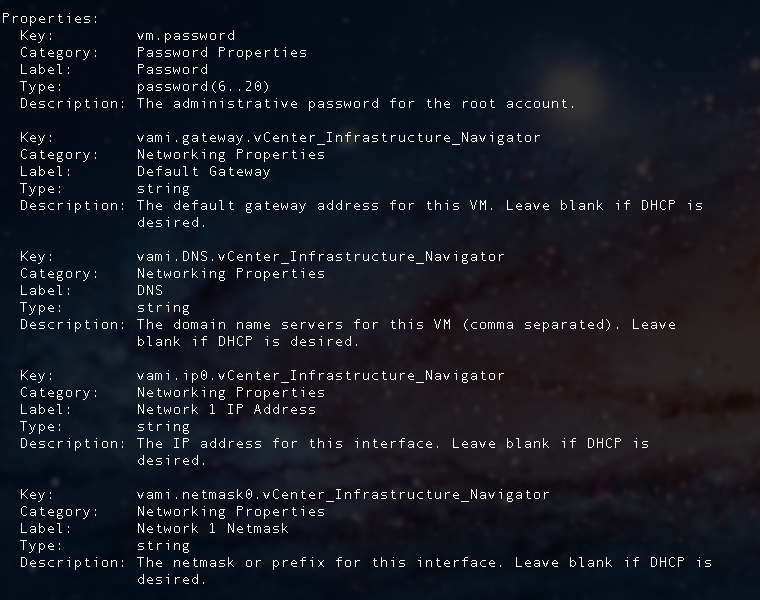 You will also need to connect to a vCenter Server 5 for all SDRS operations. The script is pretty straight forward and it can easily be adapted to include other configurations as required in your own environment. Hopefully this gives you a better idea on how to leverage the new provisioning APIs for Storage DRS and start automating your VM deployments onto datastore clusters and get the benefits Storage DRS in your vSphere environment. I have written several articles in the past about the awesome ovftool which is a versatile remote command-line utility for importing/exporting virtual machines in the OVF format across various VMware products. I mainly run ovftool in either the vMA or on my OSX desktop. When performing an import, the OVF files are local on the same system that has the ovftool installed. I recently came across an interesting question about using the ovftool to deploy OVF files that are located on an ESXi datastore. My initial thought was that you would not be able to deploy the OVF files since the ovftool would not have access to the files locally. After finishing a recent article about ESXi datastore management using the vCLI's vifs utility, I then realized there might actually be a way to deploy OVF files that are stored on an ESXi datastore. If you take a look on page 17 of the ovftool user guide, there is a table describing the various source locators that are supported. You can see that the source of an OVF file can be accessed by ovftool in 4 different methods including HTTP/HTTPs which is a key for this specific request. Files and folders management for a datastore is exposed through the fileManager in the vSphere API and datastores are referenced as a URL or remote path. scheme is http or https. authority specifies the hostname or IP address of the Center or ESX(i) server and optionally the port. 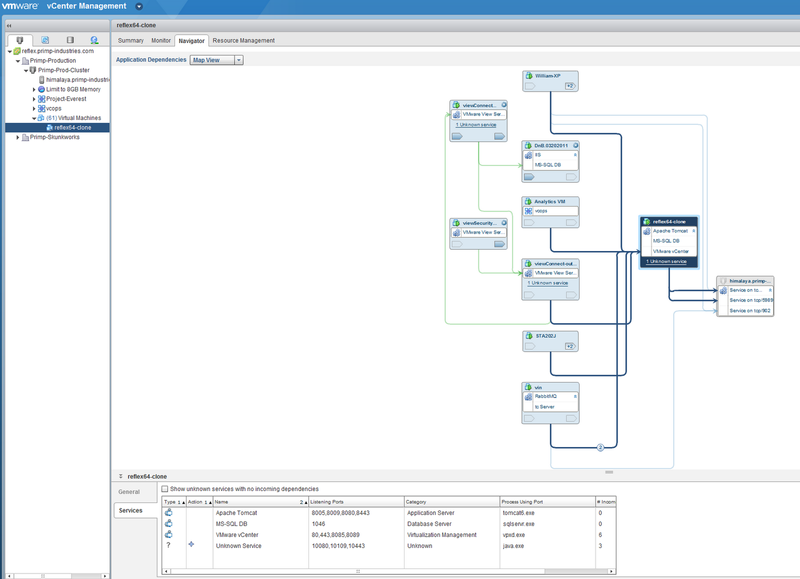 dcPath is the inventory path to the Datacenter containing the Datastore. dsName is the name of the Datastore. path is a slash-delimited path from the root of the datastore. Putting all this together, you can use the ovftool remotely to deploy an OVF file that is stored on an ESX(i) datastore. Below is an example walk through of this process. When you first login, you will be brought to the root datacenter, in the case of directly connecting to an ESX(i) host, you will only see "ha-datacenter". 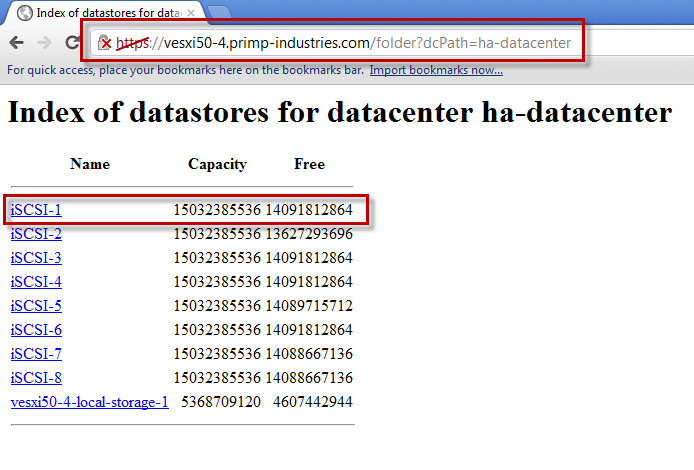 Go ahead and select it and then you will be brought to a list of datastores the host has access to. Select the datastore which contains the OVF file you wish to deploy from and then browse to the specific file. To confirm the URL path, we can use ovftool to perform a simple "probe" on our OVF, this will provide you with a quick summary of the OVF. Next we are ready to import the OVF file to our ESXi host. In this example, we will deploy the OVF to another datastore the ESXi host has access to and configure a specific portgroup to connect to the VM to after deployment. There are various options that can be passed to ovftool, please refer to the ovftool user guide for more details. One the import has completed, you should now see the VM automatically registered in your ESXi host inventory. You can see that this method allows you to import an OVF file stored on a datastore locally to the ESXi host as well as an OVF file stored on a remote datastore of another ESXi host. To help manage and deploy your OVF files, you should consider storing them on a centralized "media" datastore or even a WEB/FTP server that can be accessed by the ovftool. 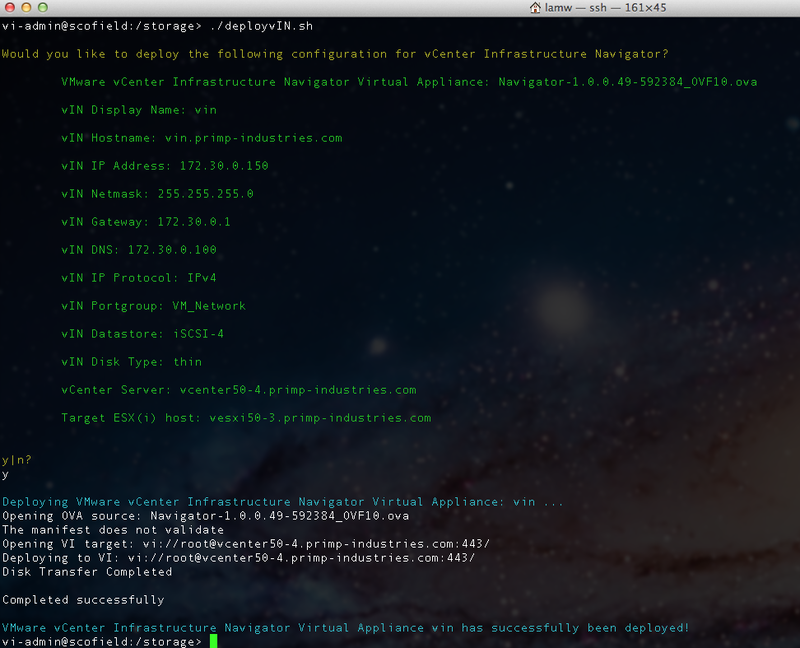 I deployed VMware's new vCenter Infrastructure Navigator in my lab over the weekend and just like the rest of the other virtual appliances (vCloud, vCO, vCC, vShield), here is how you can automate the deployment of VMware vIN. Note: Before deploying vIN, ensure that you have the vCenter advanced setting VirtualCenter.ManagedIP configured as it is needed by the vService in vIN. For more details, take a look at this blog post on how you can easily automate this. Note: There are many ways of using the ovftool to deploy an OVF. In this simple example, it requires you to specify an ESX(i) host, but you can modify the locator to deploy to a VM folder or datacenter path. For more examples and options, please take a look at the ovftool documentation. Once the vIN virtual appliance has been deployed, you can also have it automatically power on by specifying the following parameter --powerOn. While browsing the VMTN forums the other day, I just learned that you can sign your own OVF files using VMware's ovftool. To sign your OVF files, you will need the .ovf, .vmdk files and an X.509 certificate. Though not mandatory, you should also have a manifest file that includes a hash of the files to be signed. ovftool will still allow you to sign the OVF files, but a warning will be thrown if the manifest file is not included. If you export a virtual machine/vApp using the vSphere Client or the ovftool, the manifest file is automatically generated for you and it ends with .mf extension. If you have some OVF files that you want to sign but do not have the manifest file or somehow lost it, it is actually quite easy to re-create using the openssl utility. Note: There is no space between --privateKey= and the path to X.509 certifcate, else you may get an odd error message. For more details and examples of using the ovftool, take a look at the user guide here.